Catherine Pricilla (McLain) Newsome, 94, of Nevada, passed away Tuesday, January 15, 2019, at her home. A graveside service will be held this summer at Nevada Municipal Cemetery in Nevada. 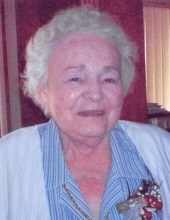 Catherine is survived by her daughter, Mari Moreland of Nevada; her son, Gene (Sherry) Newsome of Nevada; her grandchildren: Matthew Moreland, Paul Moreland, Cassie (Nick) Steenhagen, Ashely (James) Fitzgerald and Cody Newsome; and her great-grandchildren: Clarence Fitzgerald and Jentry Steenhagen. Memorial contributions may be made to the Story County Animal Shelter in Nevada in memory of Catherine. To send flowers or a remembrance gift to the family of Catherine (McLain) Newsome, please visit our Tribute Store. "Email Address" would like to share the life celebration of Catherine (McLain) Newsome. Click on the "link" to go to share a favorite memory or leave a condolence message for the family.